Do you ever feel like your life is one long “to do” list? Does it feel like people or kids expect things from you all day long until you collapse exhausted in bed each night? Are you over-committed and feeling frazzled most of the week just trying to keep the world around you from crashing into little bits? Maybe it is just me, but I bet at least some of you feel much the same way. Or it least can relate! In spite of how much I enjoy my busy life, I need to have some time to myself to recharge and re-inspire myself to carry on another week! In fact, the more I take on, the more I need focused time to myself. Anyone with kids has probably experienced how difficult it is to find time away by yourself. Sometimes you just want to hide away in the bathroom and hope no one finds you. So why not intentionally make your bathroom into your own personal retreat? We can’t all head off to the spa, so bring the spa home! I’m always drawn to “white” bathrooms and yet, I have wood and warm colored tile in this house! I do love the warm colored tile floor, however, for concealing the grime in a bathroom. A white floor is very difficult to keep sparkling clean! As I look ahead to my busy year I know I am going to take full advantage of my personal retreat. Here are some photos of the space (how it looked before we bought it complete with the required faux folliage for staging). Look! We even have a view of the water while we use the facilities! Too bad I can’t see the water while lounging in the tub, huh? Oh well. All photos (except my own, of course!) 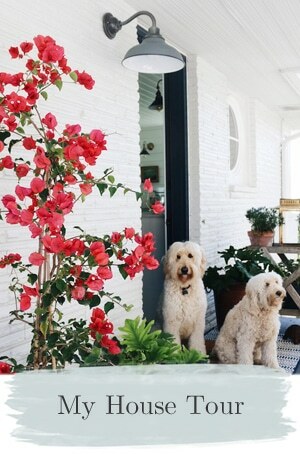 were found at Coastal Living online. As a mom of 3, I rarely even get to go to the bathroom by myself! There is no closing the door and NEVER locking it! I too have a bathroom that I am struggling with. My new home purchase last summer includes an entire wall of MIRRORS! Too much of me at age 35! Thanks for the inspiration! Personal space-5 months & almost there! I can’t wait for the bath rehab to be finished, it is turning out so much better than I planned. And, yep, already have my faux foliage (complete with glass water droplets) on the new granite counter! I haven’t so much had a problem with the kids…it’s the 2 CATS that insist on being my bathroom buddies! It seems we have almost the exact same requirements for a lovely bathroom. And yours is just fantastic. I also love the picture of the bathroom with the old fashioned cameras lining the built-in shelves. Beautiful. That’s a roomy bathroom you have there and I know that you’re so clever that it will be yours in no time. Nice view of water, too! I once had a bathroom large enough for a chair…loved that chair. And I love that wall of storage shelving that you’ve shared with us. I’d love to have a bathroom large enough to do that. Funny! I just noticed that that’s a row of cameras across those top shelves. I love having a bath, and relaxing in there, I normally read too!! Just beautiful, Melissa! My bathroom is the most neglected (not in cleanliness, mind you – just personalization) in our home. Thanks for the inspiration! I love the view from your bathroom window! I love your shower! I am dying to know if those doors are easy to clean! Thank you for this post. I am going to use it for a link on one of my Frugal Luxuries posts (I do these on Saturdays). These are all so pretty, including your new bathroom. I especially love the big window in the first blue bathroom. So pretty! I can’t wait to see more photos of your new house. I looks gorgeous! Especially the view. Love these bathrooms. Oh, can I relate. Eight years ago when I had just had my second child, we lived in a tiny grungy rental house, but we did have a half bath off the master bdrm. It felt like the most ‘hidden’ area of the house and I always wished there was room for a chair so I could just sit and get away from all the demands! 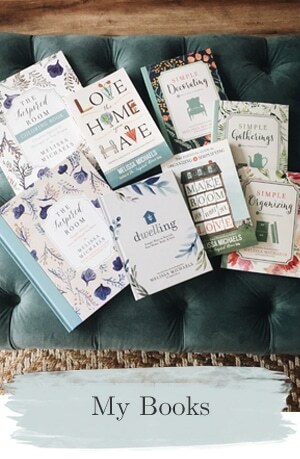 I can’t wait to see the rest of your house…everything so far is beautiful! Love the tile/stone in your bathroom! Beautiful! I know you probably get tons of these.. but I would like to share a blog award with you! My mom told a story about how all 6 family members growing up shared 1 bathroom. She used to throw a towel over her head while using the toilet to maintain her personal space! I didn’t understand what that meant until I had kids. Now it doesn’t matter that we have 3 bathrooms! The only one EVERYONE wants to use is mine! They even get mad when I lock the door for privacy… in MY own bathroom. My retreat is definitely in the bathroom, behind a good locked door and WITH a good book. Makes me want to light a few candles and take a nice hot tubby! Displaying collections at my bloggy today… teaser for BD! I hope! I hear you. But I had to laugh, thoughts came back to me when the kids were young, and they would slip their little fingers under the door, Mom what’s you doing in there…… and they still like to follow me around only I don’t get the fingers under the door any more. WOW…your bathroom is gorgeous and spacious! I am slightly envious (okay more than slightly) of your lovely soaking tub…sigh…my dream home will have it…whenever we get to our dream home. For now I am grateful for my small yet functional bathroom :) Thanks for sharing the inspiration! Stunning – I want one!!!! Okay – so I probably posted the best and funniest post I have ever done on my blog…my riding lesson photographed! ..and don’t laugh so loud that I might hear you! Julie Sizes inspiring blog post..How Would You Handle This in a Sidesaddle?? Love those white bathrooms, but they are a bear to keep clean! Your new bathroom looks so cozy with the warm tones! Love that tub! Jills inspiring blog post..KATE SPADE at Gilt Groupe! Love the bathrooms ! I especially like the second one down. I have always wanted one with a claw tub and those extension shower heads. You can have your bath and shampoo too. I always love your pictures – I especially like the built ins…..maybe I’ll see them recreated in my spaces…..
We are re-doing our master bathroom this year. It will be mostly cosmetic; tile, new faucets, mirror, and lighting. I looove the picture of the blue and white bathroom with the long wooden bench. It looks so spa-like. I also love the shelves along the entire wall in another picture. Who couldn’t load those up? Tanyas inspiring blog post..Nifty Bargain Chair! Love bathrooms, so wish I could escape more often to it… I haven’t had a good soak in the tub for a long time, everytime I do I hear “Mom” we need you or the phone rings and no one answers it…which i have to know who is calling it may be important! Really like your shower!!! Can you believe it…….after we had our 5 kids we did away with all tubs completely. No time to soak. Maybe one day when I retire??? Lovely new bathroom…I wish I had a decent one…oh well. Someday. This summer I plan to to ‘fluff’ it some…although I am limited in that. 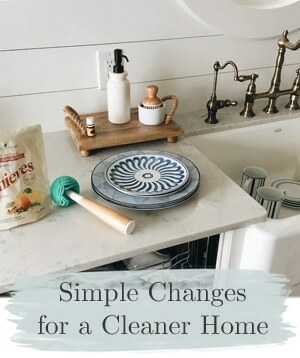 For what it is worth…Target’s $1 section this week has cleaning stuff on sale, so a squeegee to keep in that master shower would be a good idea. Beautiful bathrooms and I love the view of the water! I just wrote a post about the old commercial that said “Calgon, take me away!” I feel like that a lot! Kim@ForeverWherevers inspiring blog post..Blog Party — Tasty Tuesday — Don’t Miss It! What a beautiful bathroom you have to work with. I cant wait to see how you make it your own space. I too love to getaway and hideout sometimes. They always seem to find me though, smile. Gotta love em’…. enjoy playing house and making this nest your best! Lovely bathrooms! I need to work on creating a more relaxing bathroom space. That post is the perfect inspiration to go off and take a long bath. I love your bathroom! We are very much into the dark rustic colors. You will love the low maintenance factor of the darker colors. Thanks for sharing! 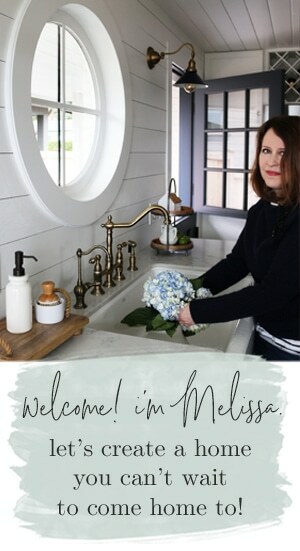 Misti @ Studio M Designss inspiring blog post..Gel Stain: Everyone should have some. I have the same struggle with my bathroom. I can’t wait to see what you do with yours, as mine is very similar! Beautiful photos! My 1941 home has a small bathroom (and a tiny closet-sized half bath). Definitely built during a time of get-in, get-out practicality. We’re getting ready to redo the full bath, and those aspects you listed are good reminders of what we can add despite the small dimensions. That’s me – that very first paragraph. That is my struggle every single day. That is why I don’t post on my blog more often. I am determined to make 2009 better – more balanced. Meanwhile, I do take long, hot baths late at night when every one else goes to bed…….so, I love seeing such beautiful retreats. Thank you, as always, for a great post. Oh how I wish my bathroom was a peaceful retreat! Our bathroom needs a complete remodel, but will have to wait a few years before we take on that project! I love the bathroom in the 3rd photo! 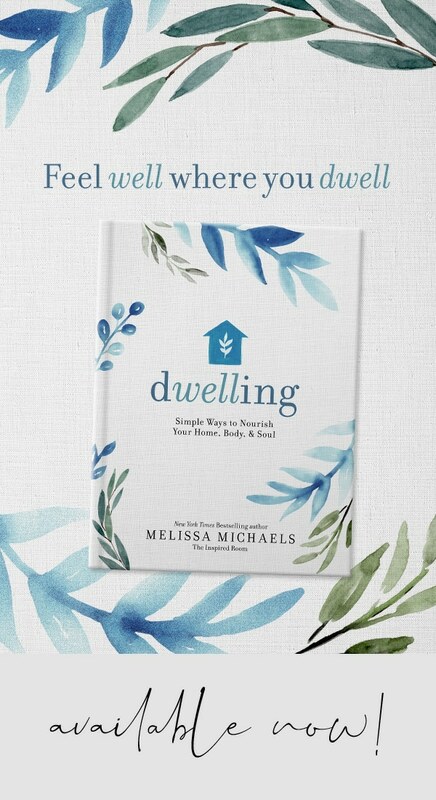 Hey Melissa, I’m having a GIVEAWAY over at my blog…stop by and enter if you get a chance…it’s a biggie! Look at those double sinks! And don’t even get me started on the tub! My word, what I wouldn’t give to have something like that. My bathroom is literally only 2 feet of space between the toilet, sink & tub. It’s also a lovely seafoam green trimmed in black. I so love your bathroom! Thank you so much for all of these lovely bathroom pictures! I’ve been looking for ideas to redo our master bathroom and these are so inspiring. P.S. Love your view of the water ;) ! Now that’s luxury!! you are going to LOVE that tub!! be sure to make yourself use it once a week. it’s so relaxing. love your bathroom list and makes me feel guilty about how dirty my bathroom is right now. meg duerksens inspiring blog post..ike…one week. You new bathroom has great bones. I’m looking forward to seeing what you “do” with it! What–no books on those big white bookshelves? No books in the bathroom?! Why, a soak is not a true soak without one soggy book! beckys inspiring blog post..The T.V. Cabinet. What gorgeous bathrooms! 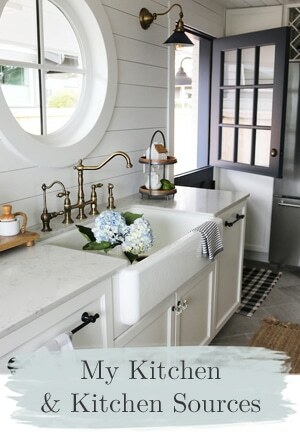 I especially love the one with the big white tub with all the windows around it, turquoise walls and the rustic bench next to the tub. What a beautiful retreat.